Want to manage your own website? A responsive mobile compatible WordPress website is what you need. We are WordPress experts! The Frankel Jewish Academy hired Web 7 Marketing Inc. to redesign their website for a few reasons. The main reason was to have the site be user-friendly on an Ipad. All the students in FJA are issued an Ipad and most of their assignments are completed on one. The second reason is they needed a modern and easy to navigate website that had all the information parents and students would need right at their fingertips. FJA also needed all their registration and enrollment forms available online for prospective students and their parents to access. The FJA management has always managed their websites themselves and the solution we provided for them let them do just that. Modular Aluminum hired Web 7 Marketing Inc. to redesign their website. The previous website did not represent the company at the level it should be represented so we were tasked to give the company website a modern look and feel. They also needed their products represented in a way engineers would like to see. We accomplished that with a interactive gallery of products and product specs. Pool Busters hired Web 7 Marketing Inc. to build its first company website. They went with our standard small business website package and our premium search engine optimization package which delivered the results they were looking for. The first website we built for their Michigan service areas did so well they decided to build a second website for the state of Indiana. Both websites now have 1st page rankings in Google for Michigan and Indiana. 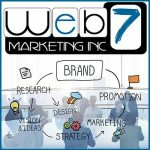 PIC of Michigan hired Web 7 Marketing Inc. to redesign their company website. PIC of Michigan is one of the few licensed companies in the state that has the experience and capabilities to handle large noxious plant removal jobs. The previous website, as in many cases, did not show the full capabilities of the company. We were asked to make a fun feeling and informative website that would educate the customer and generate leads. We succeeded. PIC of Michigan has the #1 ranked website in the state of Michigan for poison ivy removal.